How you do build high performance teams? What causes teams to fall apart? The Five Dysfunctions Of A Team is an interesting approach to building better teams, told through story. Check it out. There are countless books on team building and solving the many problems that can arise within a group. 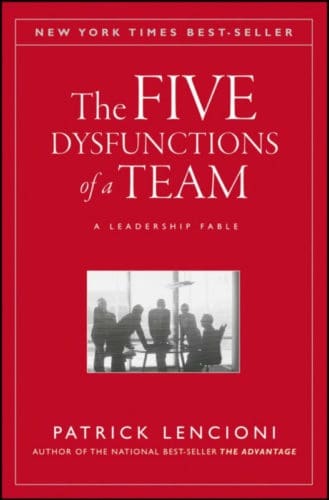 Taking a different approach to the standard team building manual, The Five Dysfunctions Of A Team is the story of the executive team at DecisionTech, Inc.
It’s a unique approach to understanding the key causes of team failure and seeing how they work through each issue. In this format, it’s easier to see how A impacts B and C, etc. We learn how each of the dysfunctions are built upon the next, feeding into one another. Members are fearful of being seen as vulnerable by other members. We’re unable to trust other team members when they don’t show their true self to the team. Team members are fearful of creating conflict. While trying to avoid conflict at all costs, they’re also unable to have productive conflict, which brings value to the team. With a lack of buy-in and clarity, team members won’t commit to the deliverables required for success. In an attempt to avoid interpersonal discomfort, team members refuse to hold each other accountable for their failings. Team members pursue individual goals and seek status, eroding the focus on greater success for the entire team. Each dysfunction is a potential point of failure in any group and each connects with the next, allowing dysfunction at one point to eat into the following too. There are plenty of things that can impact the ability of a team to work together, but they’re generally connected to one of the five dysfunctions above. By understanding the point points of high-functioning teams, we can address the underlying issues and create more cohesive groups. Pick up a copy of The Five Dysfunctions of a Team: A Leadership Fable from Amazon now and enjoy a unique take on building a better team.